Students can login here to access their timetables, report cards and the College calendar. Parents can login here to keep up to date with their child’s reports, timetable information and can also access the College calendar. Staff can login here to access Pacific’s integrated information portal including student details, class lists, timetables and the College calendar. Visit the College Library site to browse our resources, download eBooks and view other news items and information. Visit SchoolTV for a online resource designed to empower parents with credible and sound information with realistic, practical ongoing support strategies. Topics include Anxiety, Diet and Nutrition, Dealing with School Transitions, Online Safety etc. 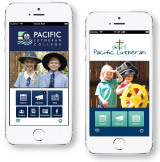 The Pacific Lutheran College and Early Learning iPhone apps provide access to the College calendar, newsletters and important notices.